Liz Schulte's Bat Country: It's Here! Honestly, I can't believe the day is finally here. I'm beyond excited to be writing this post and have to keep pinching myself so I stop jumping up and down squeeing like the fan girl I am at heart. I love books, I love reading, and I love everything that has to do with either. The experience has been a whirlwind of awesomeness so far. I have met so many wonderful encouraging people and so many people who have helped me along the way that I recognize how fortunate I am. Hugs all around! 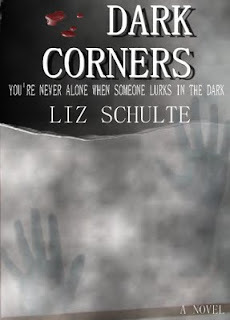 Dark Corners is a fast-paced mystery that will keep you on the edge of your seat and take your emotions on a roller coaster ride. You will meet Ella Reynolds. Ella has become one of my very favorite characters to write. She is snarky and stubborn, but soft and gooey deep inside--though she wouldn't appreciate my saying so. She is a mass of contradictions: strong and fragile, tough and soft, funny and sad, alone but surrounded by ghosts. Her husband's murder changed everything for Ella and this is the story about leaving the past to find a future. Below is an excerpt I brought to share with you and if you make it all the way to the end there might be something about entering to win a free copy of Dark Corners! The next morning I showered, dressed, and brushed my teeth. Surprisingly there was no residual lag from the cold medicine; in fact, I felt great. I walked into the kitchen, humming. Maybe it would be a good day. My eyes lifted from the pair of dark brown shoes that stood in the center of my kitchen in slow motion up to the tan chinos. I couldn’t make my eyes move any faster or break the paralysis of the fear that seized my body. My eyes reached the man’s plaid shirt and his strong, meaty looking hands thumbing through my mail as if he had every right to be there. His clothes looked like that of an upstanding citizen, but his eyes were something else. When my eyes finally met his, a sinister smile spread across his handsome face, but never reached those cold, reptilian eyes. My heart skipped a beat, maybe several. I backpedaled as fast as I could. Turning myself around, I sprinted to the front door, a scream lodged in my throat. The door wouldn't open. I pulled with my whole body, but it stayed firm. I could hear the man casually walking up the hall behind me. Too afraid to look, I dashed up the stairs and barricaded myself in my room. He meandered up behind me as if he had all the time in the world. His heavy footsteps thudded directly to my bedroom door. Each loud thump was like a hammer hitting my head. I sank to the floor against the door, pulling my knees into my chest, and covering my ears. The door behind my head vibrated with each slow, deliberate knock. I could not panic. . . . I would never survive if I panicked. The third knock was accompanied by a shrill ringing noise. I wondered if I was screaming, but then I realized the sound wasn’t coming from me…. You made it. Now on to the free book! Woot, woot! All you have to do is follow me and leave a comment telling me under what circumstances you would agree to live in a haunted house. 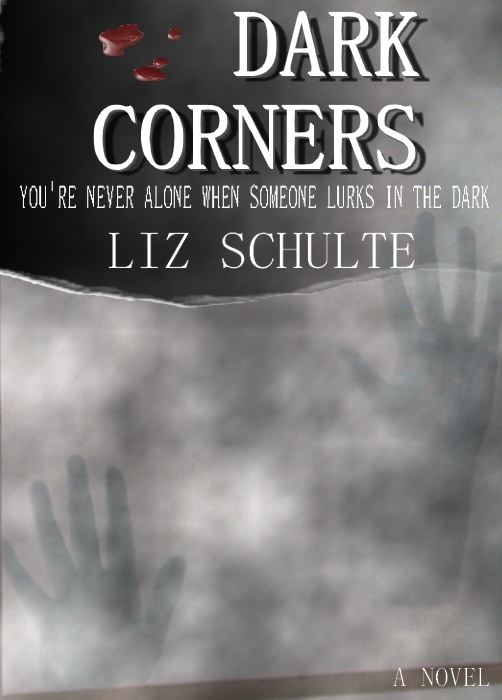 Two lucky people will be chosen to receive a free e-book of Dark Corners. If you would like to enter multiple times any follows on Twitter and Facebook will count for an extra entry (you can find links on my Social Me page). Thank you all for coming by and I wish you luck. For those of you reading the book I hope you enjoy the ride. Yay! congrats, that is so exciting!!! Since I just added in the question the two above are grandfathered in without the answer to my question. I would live in a haunted house if the ghost was benevolent or neutral! Especially if it was an awesome house. Hi Liz!! So excited for your upcoming release! Congrats! Already following on Twitter & FB. Now following Dark Corners FB page & your blog. Thanks Elena. I would LOVE to stay in a haunted castle in Scotland!! How cool is that!?!? Congratulations!! I agree with Elena, Scotland would be amazing for a haunted house! Or.. if I was getting paid for it.. lol. I follow you here, on Facebook (Michelle Reed) and Twitter (@imabookshark). I would never agree to live in a haunted house - no way! Just call me chicken! ;-) I follow you on Facebook and Twitter, too, but I think you know that! Congrats and continued success! Mickey, getting paid for it would help. I always thought I could do well on one of those shows where the put a group of people in the haunted place. I know MTV used to have one; I think it was called Fear or something. Hello Pam! Hahaha it couldn't be THAT bad right? Thank you! Congrats on your release! It sounds like a great story! I think I'd be intrigued enough to stay the night in a haunted house, if it was only a night or two. After that I'd be outta there, lol! Your book sounds amazing and your cover is SUPER SPOOKY! I can't wait to read it. :) Maybe after I read it, I'll do a post about it on my Friday FaBOOolousness: The "Boo" factor? I love scary movies, haunted & ghost stories, you name it! I think I'd need a never ending supply of clean underwear!!!!! I really don't do well with frights!! I'd give it a go though if it was a friendly ghost, not an axe murdering ghost!!!!! Congratulations! How exciting for you! I would love to win a copy of your book because I absolutely love to read good mysteries! Congrats Lizzie (came through via a Laura Tweet) I am so excited for you! I would live in a haunted house because once you get past the fear element, they're just a flatmate who doesn't hog the bathroom, or take the last of the milk without re-topping it up. The best of both worlds - company and having the house to yourself at the same time. Congrats on the book and best of luck to you! I'm lucky enough to live in a haunted house already for 2 days out of the week. I know half a dozen people who swear my fire station is haunted. I haven't seen anything, but there are quite a few unexplained noises, and I've talked to people who have seen apparations. But truth be told, even though my station ranks pretty low on the haunt-o-meter, it's plenty haunted for me. I would find it hard to get into the spirit of things. Good luck with your book Liz!!! Very exciting!!! I'm so pleased for you.